Hey everyone�remember back when I made the Easy Artisan Bacon-Cheese Bread? I know many of you tried it and loved the results. Well, I�m back with the same bread but with a new flavor, roasted garlic-rosemary.... In small bowl, combine yeast, sugar, 3 tablespoons olive oil, and 1/2 cup warm water (105 to 115 degrees F); let stand until yeast mixture foams, about 5 minutes. Grease your hands with olive oil as the dough is sticky. Shape the dough into 2 small rounded oval loaves. Sprinkle remaining rosemary over the loaves and press lightly into the surface. Let loaves rise again until doubled, about 45 minutes. Preheat oven to 375�F. Put a small pan of water in the oven to help make �... 4/01/2013�� In the bowl of a stand mixer fitted with the dough hook, add flours, rosemary, Italian seasoning, and pepper. Mix to combine. Add in the yeast water and olive oil and mix until dough starts to form and starts to pull away from the bowl. 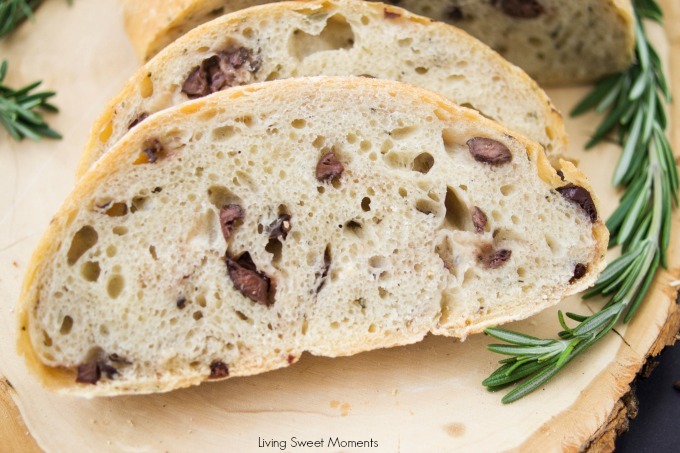 This rosemary and kalamata olive bread is authentically delicious! Whether you mix the bread in a bread machine or by hand, this is a fabulous bread for any olive-lover. This kalamata olive bread recipe makes a large loaf of bread in a bread machine. It's an easy preparation, and the olives make it an excellent bread to serve with a spaghetti dinner. The dried basil adds an additional herbal flavor to the loaf.